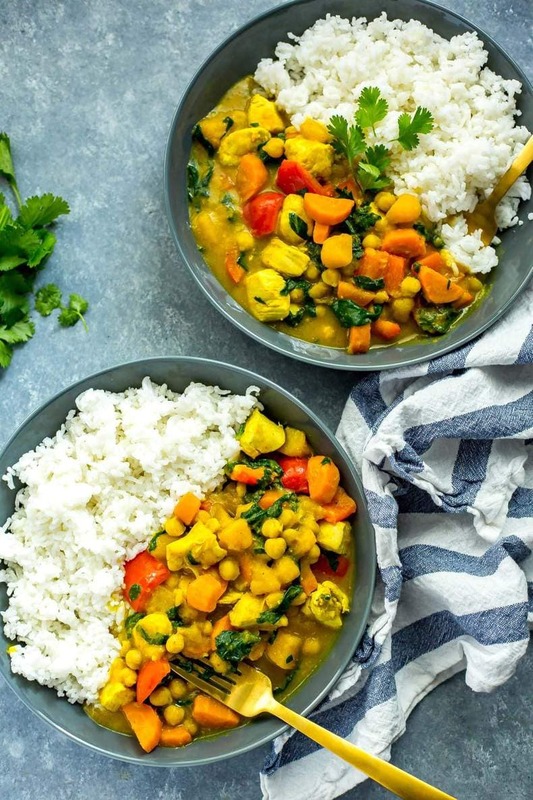 This One Pot Butternut Squash Chicken Curry with coconut milk & chickpeas is a protein-filled, heartwarming fall meal that comes together in under 40 minutes! Heat 1 tbsp olive oil over med-high heat in a large, deep pot. Add chicken and saute until browned, about 5-6 min. Remove from heat. Add remaining tbsp of olive oil, squash, carrots, garlic and ginger cooking for 4-5 min until veggies start to get tender. Add stock, coconut milk, curry powder, turmeric and salt, bringing to a boil and then let simmer for 15 minutes. Add chicken back in, along with chickpeas and red pepper and cook another 4-5 minutes. Remove from heat, stir in spinach and serve in large bowls alongside basmati rice. Garnish with cilantro and serve! ALTERNATIVE SLOW COOKER METHOD: Dump all ingredients in the slow cooker except chickpeas, spinach, cilantro and rice and cook on low for 6-8 hours. Add chickpeas in 1 hour before serving. Stir in spinach right before serving, and serve with rice, topping with cilantro.